This tea had a long strange journey from idea to ready-to-introduce-tea. It began in a conversation with a Twitter friend about our teas, and how there were a dizzying number she wanted to try and had we ever considered offering a single teabag as a mini-sample. We hadn’t. But once the concept had been introduced it was one that seemed to make a whole lot of sense, if we could figure out a decent way to hold a single teabag without using a tin. However, she’d also suggested a method for making teabag holders. Origami. Which is something Mister Tea has off and on enjoyed for years. So he spent a bit searching the web for patterns, and then another chunk of time testing patterns, and finally found one we both liked. I’d asked her to fill out the survey, so I could choose an appropriate selection for her, for our teabag containment mailing test. 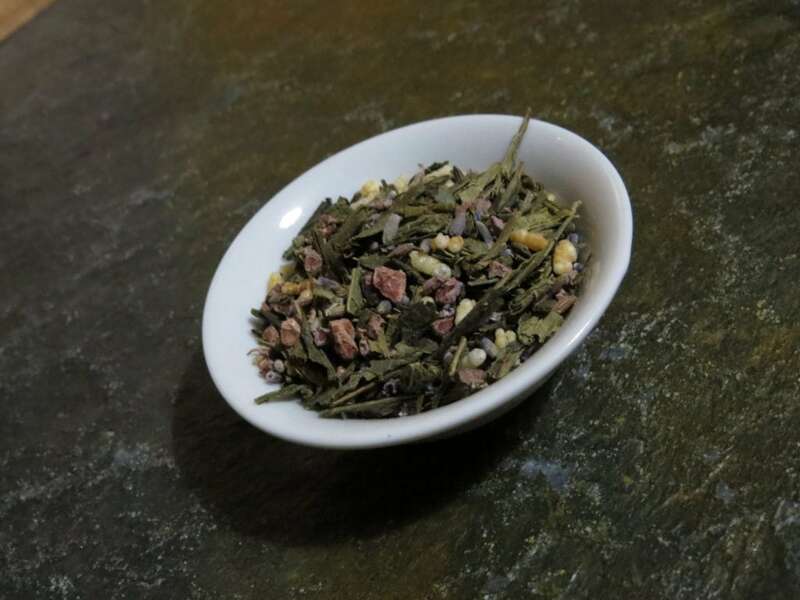 After reading it, my brain decide a Chocolate Lavender Genmaicha needed to be made. I was a little leery of chocolate and green tea, and worried that I wouldn’t be able to make it work right. It turned out wonderfully, and I learned that chocolate and green could be filed into the “possible options” section of my brain. I’d commented on our project, and a longtime good friend of Mister Tea’s mentioned that it sounded like a tasty idea. We passed along a sample of the tea during a tiling project, and he let me know that both he and his fiance had greatly enjoyed it. They were caught up in the chaos that goes along with the lead-up to a wedding, and apparently it was more than enjoyed, it also helped them to stay calm and level during the process. A custom tea commissioned near the beginning of Desert Sage Natural provoked a habit. When people we know are starting the journey of marriage, we offer to create a tea for them, hoping to give a unique gift that appeals to both. 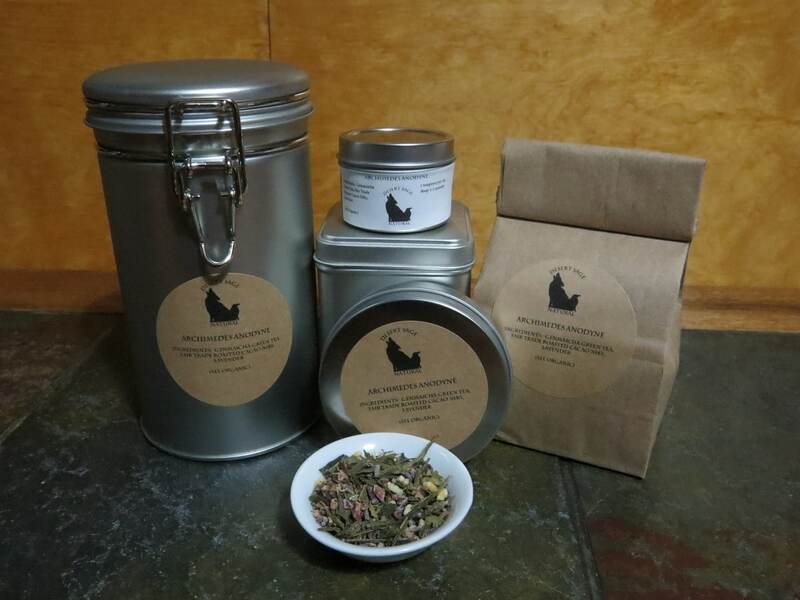 We also have started the practice of making these commemorative teas part of our ChariTea line, finding a charity that is important to the couple. When offered a tea, they asked for this one. The name comes from the name of her childhood parrot and the sense of ease the tea gave her. The proceeds of ‘Archimedes Anodyne’ will be donated to the New Mexico Cancer Center – as it was the location where she was given the treatments that defeated her cancer. This entry was posted in ChariTeas, Chocolate, Floral, Green Tea, Things We make (Tea, Coffee, Cocoa) and tagged ChariTea, Chocolate Green Tea, Chocolate Lavender Tea, Desert Sage Natural, Lavender Green Tea, Organic Fair Trade Roasted Cacao Nibs, Organic Genmaicha Tea, Organic Green Tea, Organic Lavender by DesertSage. Bookmark the permalink.